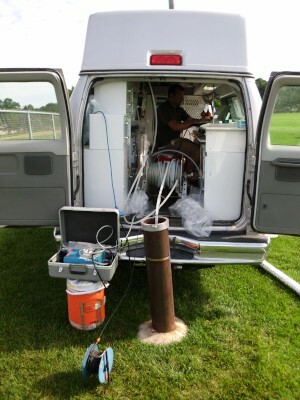 USGS scientist sampling groundwater from a well for contaminants of emerging concern, Minnesota. Photo Credit: Michael Menheer, USGS. A team of U.S. Geological Survey (USGS) and Minnesota Pollution Control Agency (MCPA) scientists measured 127 organic chemicals in groundwater underlying urbanized areas in Minnesota. These chemicals include ones commonly used and consumed in our daily lives, in products such as human–use and veterinary pharmaceuticals, fragrances, surfactants, plastic components, and fire retardants. The chemicals are often called "chemicals of emerging environmental concern" because the risk to human health and the environment may not be known. These newly recognized contaminants represent a shift in traditional thinking because although many are produced industrially, they are dispersed to the environment from domestic uses. The study was designed to support the MCPA's monitoring program to measure contamination in groundwater in urbanized areas of Minnesota, including the Twin Cities Metropolitan Area. The majority of Minnesotans—about 78 percent—use groundwater as drinking water; therefore, monitoring is essential to evaluate the status of the quantity and quality of groundwater to meet citizen’s needs. The 118 wells sampled ranged from 9 to 285 feet deep and were chosen because previous studies indicated that they were in areas at risk of contamination. None of the chemicals were detected in 65 percent of the samples, while 35 percent of samples contained at least 1 and as many as 10 chemicals. Thirty five distinct chemicals were detected. Chemicals were detected in wells open to shallow sand and gravel aquifers as well as deeper bedrock aquifers. One–half of the 33 deeper bedrock well samples had a detection of at least one chemical. The chemicals studied typically are found less commonly in groundwater than in streams and lakes, which often have a more direct influence from wastewaters. The most frequently detected contaminant in the study was the antibiotic sulfamethoxazole (11.4 percent of the samples), which is used most commonly to treat infections. Pharmaceuticals like this antibiotic enter the environment from the disposal of unused medications and from doses that pass through patients and enter the environment in wastewaters from septic systems and treatment plants. Most of the detections (11 of 14, or 79 percent) of sulfamethoxazole were in samples from domestic wells or monitoring wells located in areas where septic systems are prevalent or where leaking municipal sewer pipes may exist. Other chemicals detected in at least 5 samples were bisphenol A, a component in plastic; tributyl phosphate, a flame retardant; diphenhydramine, an antihistamine; and the antibiotic azithromycin. None of the 14 detected chemicals with water–quality standards were found at concentrations considered unsafe to human health. Twenty one of the contaminants detected in the study—including some of the most commonly detected chemicals like tributyl phosphate and diphenhydramine—have no Federal or State health benchmarks. This work was funded by the USGS Cooperative Water Program and the Minnesota Pollution Control Agency through the Clean Water Fund. Contaminants of emerging concern in ambient groundwater in urbanized areas of Minnesota, 2009–2012, 2014, U.S. Geological Survey Scientific Investigations Report 2014–5096, 38 p., with appendix,http://dx.doi.org/10.3133/sir20145096.